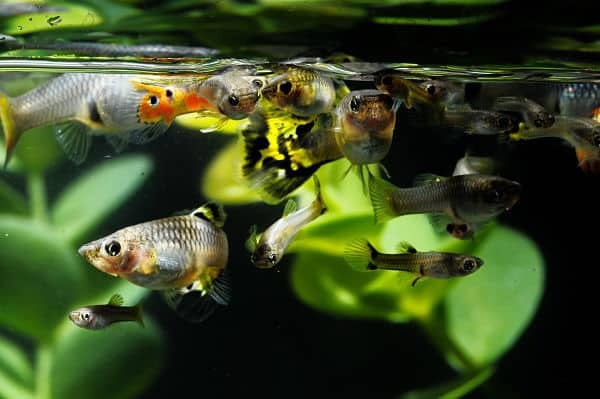 Small freshwater aquariums are growing in popularity for many good reasons. Smaller aquariums cost lest to buy compared to large tanks. The aquarium, lighting and filtration systems are smaller, reducing the initial purchase price. And, let’s be honest, not everyone wants a “widescreen” aquarium that fills a room. Whatever the reason, small aquariums are popping up everywhere from the bedroom to the boardroom. 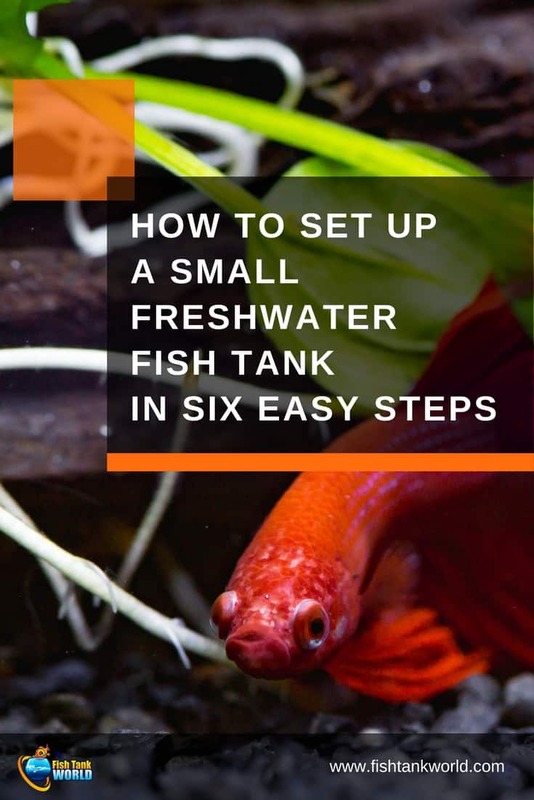 If you’ve been thinking about setting up a small tank, there’s good news. Aquarium manufacturers are designing attractive, modern-looking aquariums that fit into any décor. Most small aquariums come in kit form and include just about everything you need to set up the tank. Check out this article where we review the best small fish tanks on the market. If you’ve never started an aquarium it can seem a little overwhelming and you may be stuck in wondering how you need to set it up. Not to worry! 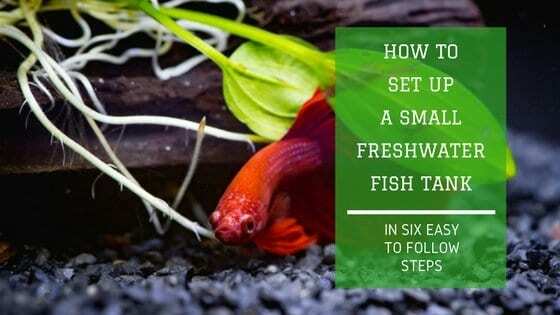 In six steps we’ll explain what you need to know to set up a small aquarium in your home or office. Let’s get to them one by one! One of the big advantages of a small aquarium is that it can fit into a variety of locations that would never work with a large tank. There are some important factors to take into consideration when evaluating potential spots for your aquarium. Water weighs about nine pounds per gallon. If you want the aquarium to sit on a shelf, you’ll probably have to limit the tank size to a few gallons. A three-gallon aquarium will weigh at least 30 pounds in addition to the weight of the gravel, ornaments, filter and light. The key point is to be sure the piece of furniture you place the aquarium on will be able to safely support it. If you have small children, make sure the aquarium is placed high enough so they cannot reach into the aquarium. The aquarium will need electric to power the light, heater and filter system. Small aquariums don’t use a lot of power. You’ll be able to run everything from one outlet. Use a high-quality power strip to keep all the power cords neat and tidy. Avoid locations that are very warm or cold. The space near a wood stove could cause the aquarium water to over-heat. Aquarium heaters help to warm and stabilize the water temperature but they can’t overcome a really cold room. An unheated basement is probably not a good place for an aquarium. Check out our complete guide on where to locate the aquarium at home. Aquarium manufacturers have created a variety of small aquarium kits to suit any room décor. The most basic and inexpensive aquariums have the conventional square or rectangle shape. The light is built into the lid of the aquarium. You’ll also find cylindrical and rounded “bowfront” aquariums. These are great for children’s bedrooms, dorm rooms and in the classroom. The basic tank designs probably won’t impress in the living room, kitchen or office waiting room. The good news is you won’t have to settle for budget style in your apartment, home or lobby. If you’re willing to spend a little more, you can choose from a variety of modern, stylish aquariums that fit into contemporary settings. These kits have built-in filtration, heating and lighting systems. Some feature LED lighting that can be customized by color and dimming. You’ll be able to set the mood just by pressing a button. Today’s modern aquariums are quiet! No humming or splashing sounds. You’ll be able to read a book or watch a movie without annoying sounds coming from the aquarium. It’s important to take your time when setting up your new aquarium. Whether you’ve purchased individual components or are using a complete kit, make sure all the equipment you need is on hand. Place the aquarium in the selected location. Double check that it “fits” in that space and you’re happy with how it looks. Now is the time to change your mind on location, before water is added to the tank. Rinse the gravel with tap water to wash away dust and fine particles. Add the gravel to the aquarium before filling with water. Add the decorations to the empty aquarium and then add water. Caves, rocks and plants displace water, so add them first then fill the tank ¾ full of cool water. This will give you room to work inside the aquarium, arranging the ornaments without sloshing water onto the floor. Install and plug in the aquarium heater. Set the thermostat for 75-78°F. It can take up to 24 hours for the water temperature to stabilize. Use an aquarium thermometer to monitor the water temperature. Adjust the heater’s setting if necessary. Assemble and plug in the water filter as instructed by the manufacturer. If you have municipal chlorinated water, add a water conditioner to neutralize chlorine disinfectants. Try out the aquarium light to learn how it functions. If it has a built-in timer or you have a separate timer, set it up so the aquarium is illuminated for no longer than 12 hours a day. Reducing the lighting period to when you are home enjoying the tank, can prevent excess algae growth. New aquarists sometimes make the mistake of purchasing fish before the new aquarium is set up. This causes the set-up to be rushed and results in mistakes and fish stress. The ideal situation is to set up the aquarium and allow the tank’s hardware to run for 24 hours to make sure everything is working properly. This gives you time to make adjustments before fish are added to the aquarium. Once the aquarium system is operating properly it is time to add a few fish to start the biological break-in process. Aquariums don’t need to “age” before adding fish. The biological processes that keep the aquarium clean cannot start until fish are added to the aquarium. But not all the fish can be added at one time. For aquariums between 2 to 5 gallons, add two fish. For aquariums from 5 to 10 gallons, add four fish. This is a somehow generic indication as ultimately it depends on the fish you stock in the aquarium. Do not miss to check out this article on the top 16 fish for a small saltwater tank. Adding too many fish at one time will overwhelm the undeveloped aquatic system. Tropical fish release ammonia as a waste product. It will take about 30 days for the new aquarium to develop a fully developed biological filter. Over the first four weeks, feed the fish once a day. Feed a small amount of food that is fully consumed within three minutes. The temptation is to over-feed or add too many fish all at once. This short-circuits the process and prevents the aquarium from achieving biological balance. The first 30 days are critical for the long-term success of your new aquarium. As the biological balance develops, the water may become a little cloudy. This is normal and will clear up over time. New aquarists sometimes panic, drain the aquarium and start over. All this does is re-start the natural break-in period and stress the fish. However, over-feeding the fish will cause cloudy water, odors and sick fish in new and established aquariums! Tropical fish will always act hungry when they see you approach the tank. Resist the urge to over-feed them. Once a week test for ammonia with an ammonia test kit. Testing will show that ammonia levels rise and fall over the first few weeks. As a general rule of thumb, if the ammonia level climbs above 0.5 parts per million (ppm), make a 20% water change to dilute the ammonia. After 30 days make another 20% water change. Be sure to use a water conditioner to remove chlorine chemicals from tap water. After 30 days you can add more fish to the aquarium. Aquarium additives containing live beneficial bacteria will speed up the development of the biological filter and reduce the chances of ammonia problems. Your aquarium will require maintenance to keep it looking beautiful. Change the filter cartridge every 30 days to keep the water clear. Algae will eventually grow in the aquariums but it does not have to become a nuisance. Use an algae scraper to clean the glass every two weeks or when algae first appears. Algae gradually builds up on the glass until it becomes visible. Periodic algae scraping will make it easier to keep the aquarium looking clean. If algae grows on the ornaments and plants, remove them and gently scrub them with a soft brush or cloth. Check out this article if algae are a problem. Solid organic particles composed of dead algae cells, fish waste and uneaten bits of fish food accumulate as “sludge” in the gravel. A build-up of organic sludge can become a breeding ground for disease-causing organisms. Decaying matter also releases algae-promoting nutrients into the water. Use a gravel siphon to easily remove the sludge and change some water at the same time. Monthly water changes remove nutrients, solid debris and substances that discolor the water. 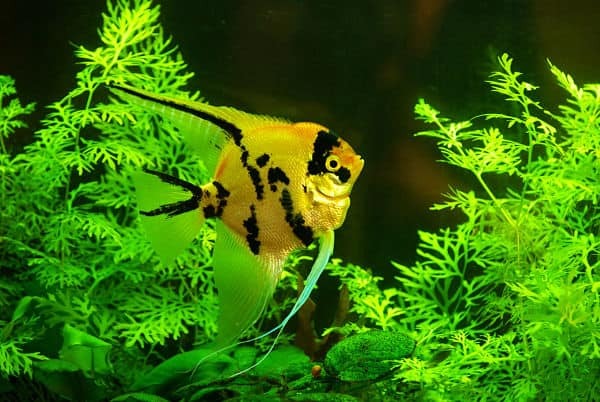 This article will provide you further information to clean the aquarium. It’s not hard to have a beautiful aquarium in your home or office. Today’s small aquarium kits make it easy to place an attractive, modern aquarium in any room. The key to keeping your aquarium looking great with healthy, colorful fish is no secret! Have patience as you follow these six simple steps and your aquarium will always be beautiful. Rushing ahead or skipping maintenance leads to more work and reduces success. Follow this guide and you should be able to enjoy your new aquarium’s relaxing beauty.